In light of the tough farm economy, dealers are offering producers even more options when it comes to purchasing upgraded equipment. Because different tax implications flow from different contractual arrangements, it is crucial that a producer understand the true nature of a lease or purchase contract before he signs it. This will avoid big surprises come tax time. It is important to understand that the IRS does not always consider a “lease” a “lease.” What matters is not the name given to a transaction by the dealer, but the economic realities of that transaction. If a “lease” doesn’t act like a “lease,” the IRS won’t treat it as one for tax purposes. True equipment leases are often called “operating leases.” An operating lease is one where the farmer pays for the use of the equipment for a term, nothing more, and nothing less. An operating lease is not a rent-to-own agreement. If the producer does wish to purchase the equipment at the end of the term of the operating lease, the purchase price will be roughly equivalent to the fair market value of the equipment at the time of the purchase. If equipment is leased pursuant to a true operating lease, the farmer can deduct the rental payments from income as ordinary and necessary business expenses. The agreement designates part of each payment towards an equity interest that the farmer will receive in the property. The farmer gets title to the property after paying a stated amount of "rental" payments required under the agreement. The amount the farmer must pay to use the property for a short time is an inordinately large part of the amount he or she would pay to get title to the property. The farmer pays much more than the current fair rental value for the property. The farmer has an option to buy the property at a nominal price compared to the value of the property when that option is exercised. The farmer has an option to buy the property for a small amount compared to the total amount paid under the agreement. The agreement designates some part of the payments as interest, or parts of the payments are easy to recognize as interest. The IRS treats a capital lease as a purchase for tax purposes. Payments (except for interest payments) are not deductible. Instead, the cost of the equipment is capitalized and depreciated over time. In many cases, the purchase may qualify for the enhanced IRC § 179 deduction and/or bonus depreciation. 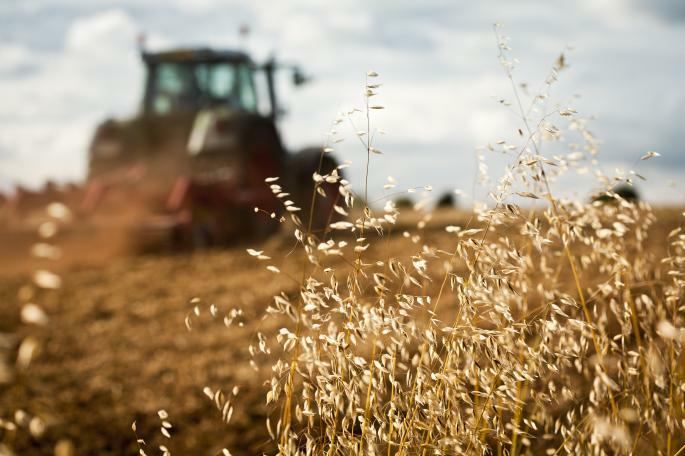 Where these transactions can get especially complicated is where a farmer trades in equipment as a down payment on a capital lease or to cover a portion or all of the required lease payments under an operating lease. Here, properly distinguishing between an operating lease and a capital lease is crucial to avoid an unexpected tax bill. Often, if a farmer trades in a piece of used equipment, that equipment will have been fully depreciated. In other words, it will have a tax basis of 0. If the lease is a capital lease (or a purchase agreement), the farmer may take advantage of IRC § 1031 like-kind exchange rules to avoid recognizing recapture income from that trade. Paul Purchase trades in a tractor with a $100,000 fair market value for a new tractor. The net present value of the purchase price for the new tractor is $350,000. Because he fully expensed the cost of his used tractor under IRC § 179 when he purchased it, Paul’s trade-in has a tax basis of 0. If the transaction is properly structured as a capital lease (or a conditional sales contract), Paul can use like-kind exchange rules to avoid recognizing recapture income from the trade-in. Paul can begin depreciating the new tractor with a starting basis of $250,000. If appropriate, Paul can use IRC § 179 or bonus depreciation to immediately expense that amount. Paul can also deduct the interest paid yearly under the agreement. Contrast the above result with that flowing from an operating lease or a true lease of the new tractor. Any used equipment offered by the farmer to the dealer as a payment toward the lease price will be considered sold (not exchanged) to the dealer. Like-kind exchange rules do not apply to an equipment lease. Consequently, if the tax basis in the used equipment is “0,” the farmer must pay ordinary income tax on the value of the tractor traded to recapture depreciation already taken. He will be able to deduct the lease payment, but only over the term of the lease, not all up front. Larry Lease trades in a tractor with a $100,000 fair market value to lease a new tractor (with a value of $350,000) for a four-year lease term. Larry’s used tractor has a tax basis of 0. Under an operating lease, Larry will have sold his tractor to the dealer in this transaction. Consequently, he will recognize $100,000 in ordinary income (no self-employment tax) in the year of the sale because of rules requiring depreciation recapture. Larry will be able to deduct from his income the amount of the lease payment, spread out over the four-year term of the lease, or $25,000 each year (assuming a full calendar year lease-term). As with all complex business transactions, producers are advised to consult with a trusted tax professional before entering into any agreement to use or acquire farm equipment over time. An arrangement that might benefit one producer might be detrimental to another. The details matter.